1. This document is considered to be an Emergency Measures Plan for those smaller communities which are not designated as a City or Town. This document has been developed to put in place a plan of action for these municipalities in the initial stages of an emergency situation. Responsibility for the management of municipal emergency operations rests with the local authority (Chair and Council). The local authority may be advised and assisted by representatives of provincial departments and agencies in order to provide a coordinated municipal/provincial response. Should municipal resources be insufficient to deal with the emergency, assistance may be requested from other Mutual Aid areas or the Provincial Government through the PEI Emergency Measures Organization. that responsibility to respond to emergencies carries a parallel responsibility to plan and prepare for them. By extension of these principles it is logical that municipal governments should cooperate and provide emergency assistance to one another in emergency situations, before calling on the province for assistance. 3. The purpose of this guide is to put in place a plan of action to aid the municipality in providing a prompt and coordinated response to an emergency situation. 4. This guide is issued by Council, under the authority of The Emergency Measures Act. Emergency means a present or imminent event in respect of which the Minister or the municipality believes prompt coordination of action or special regulation of persons or property must be undertaken to protect the health, safety or welfare of people or to limit damage to property. 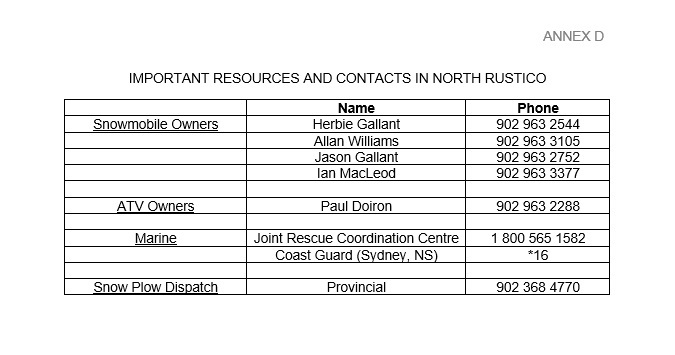 Municipal Emergency Measures Coordinator is the individual designated by Council to develop an emergency management program for the municipality of North Rustico. This position receives a direction from and reports to the Chairperson and Council. PEI Emergency Measures Organization (EMO) means the PEI Emergency Measures Organization established under the section 3 of the Emergency Measures Act which has been mandated to provide the Province with an emergency management system for the protection of persons, property and the environment in response to all emergencies and disasters. 6. In the event of an impending or actual emergency the Administrator will make arrangements for the dissemination of the fan-out Community Contact Numbers (Annex B). 7. The Municipal Administrator will be responsible for the accounting of all funds expended or committed in controlling the emergency and for keeping records of the equipment used in operation. 8. This guide will be reviewed annually by the Municipal /emergency Measures Coordinator who will be responsible for the preparation of amendments, as required, and their submission to EMO for review. 9. The Chairperson and Council – Responsibility for the management of municipal emergency operations rests with the local authority. They are responsible to exercise control over emergency operations. They have the decision making authority in the event of an emergency involving their municipality. The Municipal Emergency Measures Coordinator (MEMC) is responsible for coordinating the efficient emergency response operations in the community on behalf of the Chair and Council. He/she acts as liaison between municipal council, the emergency site and the Emergency Measures Organization. The Emergency Site Manager the emergency site will be under the direct control of the senior police officer present, senior fire chief or as duly appointed. The Emergency Measures Organization – The local authority may be advised and assisted by representatives of provincial departments and agencies in order to provide a coordinated municipal/provincial response. Should municipal resources be insufficient to deal with the emergency, assistance may be requested from the Provincial Government through the PEI Emergency measures Organization is responsible for coordinating the interface with the municipalities, The provincial government provides assistance when requested. When the emergency clearly impacts on areas of provincial jurisdiction (e.g. any emergency not in a municipality, emergencies on provincial lands) or in a provincially declared emergency the province may assume responsibility for direction and coordination of the emergency. Municipal Office – There will be a requirement for a meeting place for municipal officials and decision makers in a potential emergency situation. Meetings will take place in the Municipal Office. 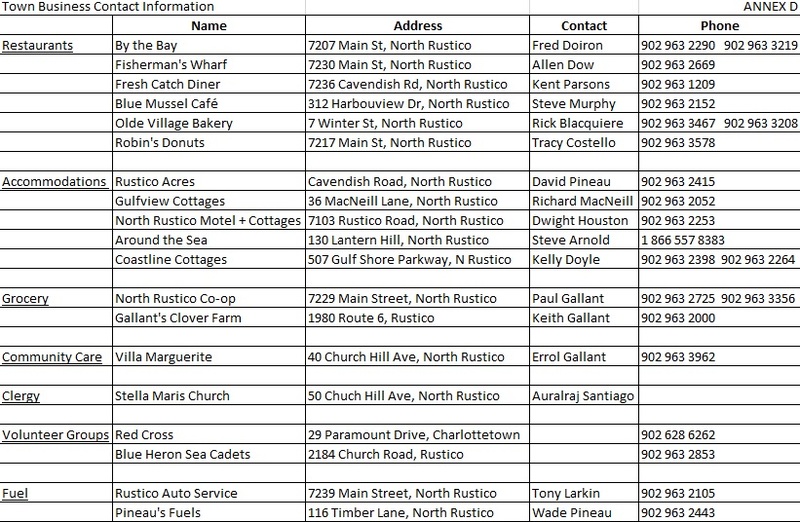 If this is not feasible then officials will meet at North Rustico Legion Home Branch Number 13 or the North Rustico Lions Club. 10. 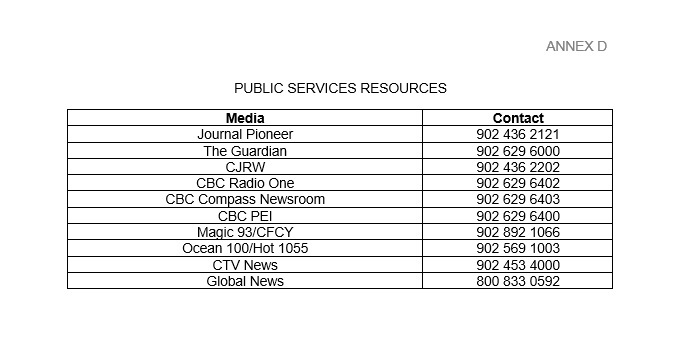 Requests for provincial assistance will be made to the PEI Emergency Measures Organization, and should be approved by an elected representative of the municipal authority. Requests may be verbal initially but must be confirmed in writing. in consultation with emergency responders, requesting assistance from the Provincial Government through the PEI Emergency Measures Organization if the situation cannot be controlled by local resources. The emergency situation may warrant several families being evacuated from their homes with no where to go. These families have to be provided with immediate lodging and feeding on a temporary basis. In the event that a declared provincial evacuation occurs, the Province will coordinate the evacuation process assisted by the municipality. A list including facilities to be used as temporary evacuation centres and feeding establishments is maintained in Annex D.
Transportation arrangements may have to be made for families in and evacuation. A public information number should be listed for those evacuees requiring transportation. Pick-up points may have to be designated and disseminated to the public. This should be arranged with the police and fire personnel on site. A list of transportation resources within the community is maintained in Annex D.
A list of all public works resources (i.e. generators, portable lighting, heavy equipment, etc.) 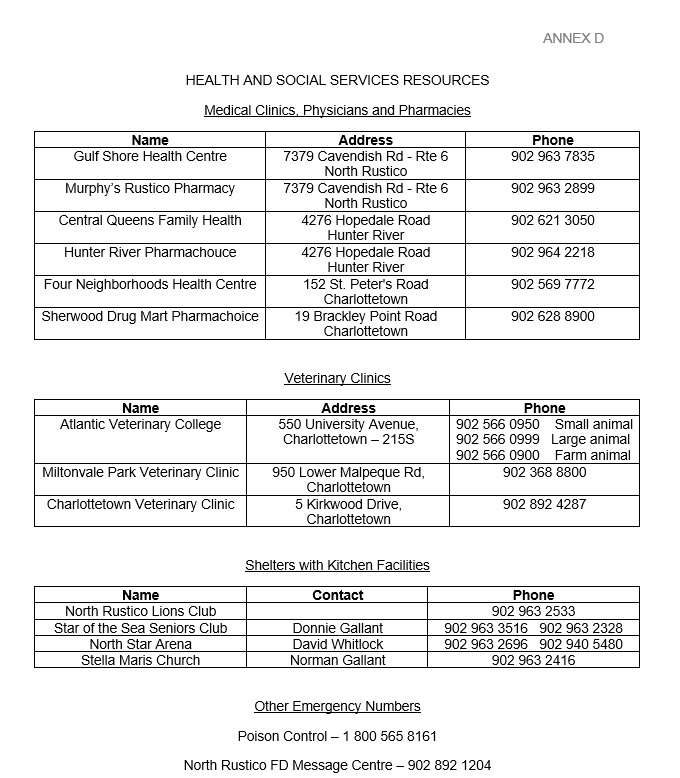 located in the area including contact names and phone numbers should be maintained to assist emergency responders. Determining where and how portable water may be obtained and distributed during and emergency is also required. 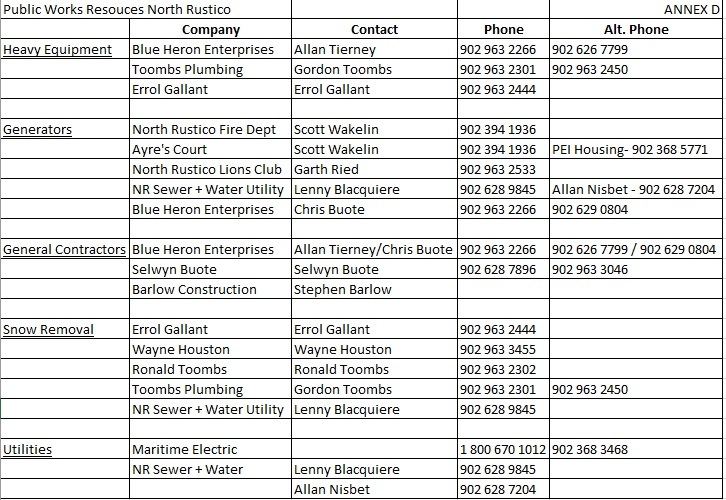 A list of Public Works resources is maintained in Annex D.
These individuals are available to be called upon to assist the Community Emergency Coordinator in an emergency situation. This proclamation is in effect until further notice. RESOURCE CONTACT BUSINESS AFTER HRS. A By-Law to establish and maintain a Municipal Emergency Measures Organization for the Municipality of North Rustico and to authorize the Municipality of North Rustico to participate to the full extent of its capabilities in the Municipal Emergency Measures Plan. AND WHEREAS it is deemed expedient to establish a Municipal Emergency Measures Plan to serve the Municipality of North Rustico. 1. 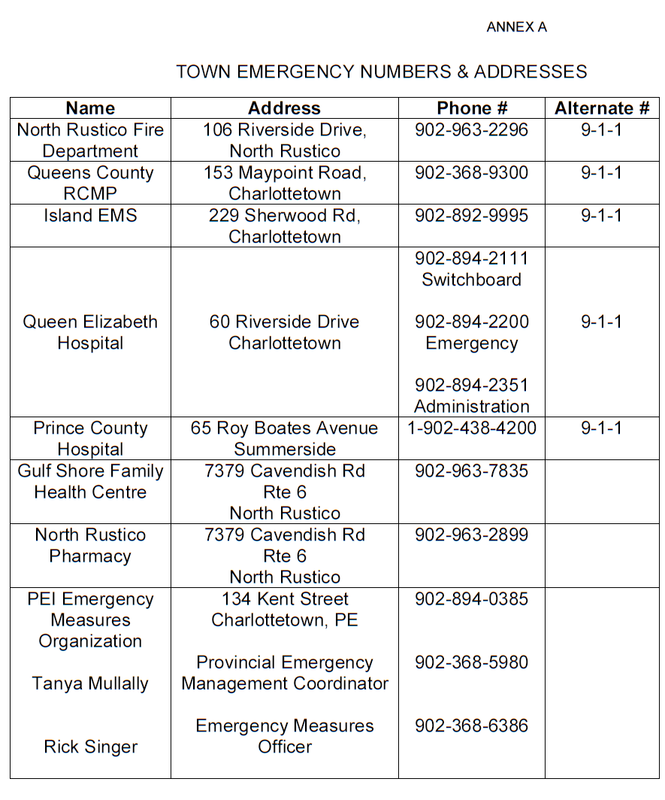 A Municipal Emergency Measures Plan is hereby established, hereinafter referred to as the Municipality of North Rustico Municipal Emergency Measures Plan. h. to carry out other similar work within the geographical area encompassed by the municipality. 4. The Chair and Council will select an individual from within the Community to be appointed as the Municipal Emergency Measures Coordinator (MEMC). This individual will receive direction from and report to the Chair and Council. b. subject to the approval of the Council to name or assign such persons, as it may deem advisable, to perform duties related to continuity of Municipal government and public survival in the case of an emergency or disaster. c. when policy decisions are required, submit the matter to the Chair and Council in the form of recommendations. d. The performance of other related duties as directed by the Chair and Council. 7. The local authority, when satisfied that an emergency exists or may exist in that Municipality, declare a State of Local Emergency in respect of that Municipality. Where the council of a Municipality is unable to act promptly in declaring a state of local emergency in a Municipality pursuant to subsection (2) of the Emergency Measures Act, the mayor of chair of the Municipality may, after consulting a majority of the members of a Council of the Municipality where practicable, declare a state of local emergency in the Municipality. I, Patsy Gamauf, Administrator of the Municipality of NORTH RUSTICO do hereby certify that the forgoing is true and correct copy of a By-Law, duly passed by Council, at a duly called and regularly constituted meeting held on the 26th day of February 2006.